Active Components: Black pepper’s pungent smell and taste originates from fruit skin and flesh. This smell is due to high concentration of piperidine and piperine alkaloids and resins in the seeds. The oil produced from them is implemented in flavorings and perfumes. History: Black pepper occupies the second place by its popularity only after the apple of Eden, as it has gained its popularity for centuries. Black pepper brought warriors of Alexander the Great and further commanders to unknown lands and peoples, where food was spicy and well-cooked, and since then people have fought much in order to have a right to own spices. Black pepper was known to be a famous trophy when it came to hostages, and in the medieval times it was sold in small quantities in Europe, and priced with gold. It was a popular tendency among the sailors and discoverers of those times to seek for an easier way to Indian spice markets, and, leading his ship, Christopher Columbus was also following this aim, when he arrived in the New World. Later on, countries across Europe were competing with each other to conquer more colonies in order to have access to spice markets. Additional Info: Black pepper is taken from an evergreen plant with broad leaves, which is specifically raised in the majority of tropical regions, including the West Indies, Indonesia, India, South America, and Malaysia. The woody vine grows onto the other trees and plants when being raised, and is generously covered with flower spikes. When fruits appear they are gathered still unripe, the time to gather them comes when the lower fruits on a vine get red. As the fruits get dry, and become gray-colored around the seeds, they are chopped and packed as powder or sold dried. White pepper is processed from pepper vine as well, still, the fruits are collected when ripe, and the fruit flesh is taken off the seeds before chopping. Used For: The herb is applied to treat flatulence, induce expectoration, stimulate the system, reduce fever, kill helminthes and prevent reappearance of the condition. As a topical remedy black pepper is used to irritate skin, stimulate blood circulation, and act as a resolvent. The list of conditions commonly cured by black pepper includes: asthma, cholera, boils, colic, diarrhea, flatulence, cough, fever, stomach disorders, indigestion, obesity, hemorrhoids, chronic rheumatism, phlegm, skin conditions, worms, sinus congestion, and sore throat. Pepper has been valued as an appetite increasing remedy for a long time, while also serving as an aid for sickness. Indian herbalists prescribed black pepper for a wide range of conditions, from toothache to paralysis. According to East Africa residents, body smell which comes as a result of eating much black pepper is a good insect repellant. To reduce temperature induced by fever Philippine residents apply the following recipe: a part of anise and a part of black pepper is mixed with a cup of brandy. The mixture is then heated up, but not boiled. To take effect the remedy is taken warm by small swallows. Each mouthful is retained for 40 seconds before drinking. 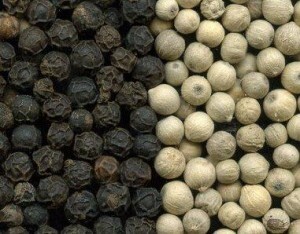 Black pepper is applied in form of gargles and liniments, as well. It is believed to stimulate gastro-intestinal functions and reduce flatulence in the bowels, while also serving as a stimulant for kidneys and heart. Besides being effective for mosquitoes, the remedy is good for repelling flies. Additionally, it is applied for repelling garden insects, which parasitize on vegetables and fruits. To relieve toothache, prepare a decoction by taking 1/8 teaspoon of pepper and aiding it with half a cup of boiling water. This should be well mixed, covered and boiled up on low heat for 5-10 minutes. The result is infused for 15 minutes and then filtered. Used as a mouthwash in warm condition, by small swallows. The remedy is kept in the mouth for a minute. The actions are repeated if necessary. Safety: Warning! Black pepper may lead to gastro-intestinal inflammations.